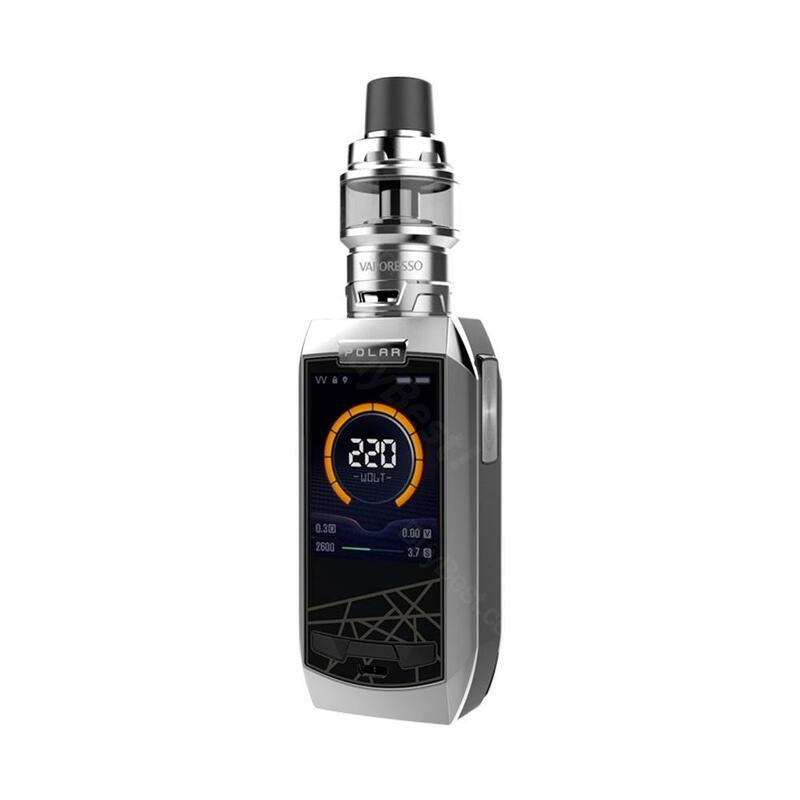 Vaporesso Polar 220W TC Kit with Cascade Baby SE Tank, which adopts 2-inch TFT screen to clearly display status of vape, comes with advanced OMNI Board 4.0 with multiple protections to ensure hign performance. Safety lock mechanism is helpful for avoiding opening top cap accidently to avert leakage effectively. Vaporesso Polar TC Kit with Cascade Baby SE Tank, which adopts 2-inch TFT screen to clearly display status of vape, comes with advanced OMNI Board 4.0 with multiple protections to ensure high performance. With 0.001S super fast firing speed and 2.5A quick charge, you will save a large amount of time. In addition, built-in mesh coil has fast heating speed and triangular airflow offers long service time of coil. Safety lock mechanism is helpful for avoiding opening top cap accidently to avert leakage effectively. Here are two versions of capacity for selection that include 6.5ml and 2ml. Just take this kit to enjoy the convenient vaping. • No battery or liquid, you need to buy them separately. • Three-month warranty for Polar Mod and Cascade Baby SE Tank. • Make a comparison shopping with Vaporesso Cascade Baby Subohm Tank. Vaporesseo is one of my favorite brands and the mod is so amazing working great and fast. The cascade tank is very nice no leaking. Just over all my favorite mods and the red glass on the tank with the red on the mod is very clean looking. There are many functions, but simple to use! Good ergonomics! The comfortable in my hand, and large enough for gravity! High-quality products! The disassembly is simple, the battery fits very well! The display shows a lot of information, but it can be read. Cascade Baby SE Tank very good atomizer for Dl use. Good taste and steam do it. The coil works well for a long time. ! The development is quality! Very good price! The kit arrived safely and quickly. It's closely packed and there are no any damage, even the plastic bag. Good for you, buybest. Some reviewers speak highly on this Vaporesso Polar 220W TC Kit. Really nice device. Received my package very fast. It's good looking and powerful. I love the 2 inch screen, which provides clear data display and comes with user friendly menu system. Fire speed is like a dream, all buttons are not loose and give good response. Battery life is decent, charging is fast. And you can easily upgrade firmware. The tank also performs great. I have no negative to say about this vaporesso polar kit. This is the kit I want so much. Finally got my package. It's packed well. The red color looks passionate. It feels good in the hand and the polar mod fires up very fast. The matching cascade baby se tank produces really amazing flavor with the mesh coil. Highly recommend! Szép szett. Gőzös jó ízű, egyszerű és nagyszerű! Patent! Ajánlom mindenkinek! I get allured by its big discount at the very beginning. When I receive it, the great quality really didn't let me down. VERY NICE KIT AND GREAT FLAVOR AND CLOUD! Best colour setup. Thank u buybest! Perfect! It's legit. I trust vaporesso, they always produce quality product. I enjoyed a lot with their first device, target kit. This new polar kit is also well built. I love the central 510 thread which allows for more tank compatibility. The included Cascade Baby SE tank is good as well. The triangle airflow delivers thicker clouds. If you are looking for a high quality setup, I would recommend you to grab this polar kit.